The paragraph above was written by Irish author Bram Stoker and included in the 1897 publication of his novel, Dracula. He wrote the story while visiting Whitby and it is said the parish of St. Mary (mentioned above) was the inspiration for his novel. What's even more interesting, at least from a 2014 visitor's point of view, is that Whitby has changed little since Stoker penned those words. Whitby is host to the bi-annual Whitby Goth Weekend, but to be honest I'd never heard about it until a visit last month to the British Library's Terror and Wonder exhibition. Yesterday I discovered a video on Youtube documenting the most recent Goth Weekend and shared it on my Facebook page. If you haven't checked it out, do. It looks like a fun weekend! Care to rent the blue and white building next door to Marie Antoinette's Bakery? The yellow stone building is The Ebor Jetworks (jet jewellery). Justin's Original Fudge and Toffee shop is on the left with the Jet Black shop on the right. FYI, jet refers to Whitby Jet which is fossilized wood having been compressed over millions of years. Its colour is unique and its blackness so intense the expression "as black as jet" has been in use for hundreds of years. 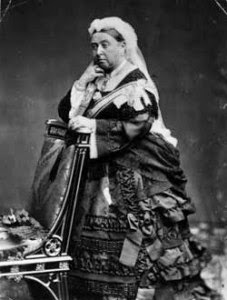 Queen Victoria was familiar with Whitby Jet and when Prince Albert died in 1861 she took to wearing jet jewellery in remembrance of him. Soon it became the accessory to wear while in mourning. Okay, history lesson complete, let's move on a short hop, skip and jump (directly across the street from our flat, in fact) to Pannett Park, also home to the Pannett Art Gallery. We strolled through this park a couple of times this week and to be honest I'm still trying to wrap my head around something this green and lush in December. Love it, love it, love it. Down the street from both the park and our flat is this picturesque hotel. To my untrained eye it certainly looks Goth! And right next door to our flat is this row house. The stone arch entryway and stairs leading down to the front door is postcard perfect. Closer to the train station is this church yard. Whitby is more than jet shops, churches and Goths, of course. It's most famous resident was James Cook...as in Captain James Cook. Born near Middlesbrough he moved first to Staithes and later Whitby to apprentice as a seaman. In 1755 he was offered command of his own ship and was present at the captures of Louisbourg and Quebec during the Seven Years War. Afterward he charted the coasts of Newfoundland and then sailed on to Australia in the Endeavour that was built in Whitby. His West Cliff memorial overlooks Whitby harbour and the Abbey ruins, dramatically featured between the whale jaw bones shown below. As I mentioned earlier, Whitby provides photographic opportunities around every corner. Narrow lanes and multiple staircases piled high atop each other give access to homes, bars, shops and pubs. If narrow spaces aren't to your liking...head to the peer for a breathe of fresh sea air.